Samantha Madison is an average, cool Washington, D.C., teen: She loves Gwen Stefani (who doesn't? ), can draw like nobody's business, and enjoys being opposite to her sister's annoying ultra-social personality. But when she ditches art class one day, she doesn't expect to be jumping on the back of a wannabe presidential assassin. Soon the young hero is receiving worldwide acclaim for her bravery, having dinner with her family at the White House, and is even being named teen ambassador to the UN. As if this weren't enough, she and David, the president's son, strike up a friendship that everyone wants the dirt on, which starts to give her romantic "frisson" feelings. Unfortunately, Sam thinks her sister's boyfriend, Jack, is the true love of her life, and she makes a few wrong turns that could screw up what she's developing with David. Will she ever stop following what she knows and start following what she sees? 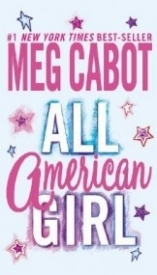 If you enjoyed Meg Cabot's The Princess Diaries, you will like All-American Girl. The two main characters have a lot in common: hair that won't cooperate, accidental celebrity, and a penchant for making lists. The plots also have a lot of similarities. Both involve a quirky, misunderstood heroine catapulted to instant fame and struggling with their love life (as most teenage girls are). Whereas Mia from The Princess Diaries was a vegetarian activist type and an only child, Sam is a ska-loving artistic hamburger eater who happens to be a middle child. Other than those differences, their voices are very similar; they could leap easily into one another's stories. However, I like Sam a little more because she grows more in the course of the story. In the beginning, she is blind to many things. With the help of her art teacher and her family, she finds her eyes opened in many ways. In the beginning of the book, Sam is envious of her sister Lucy and is secretly in love with Lucy's artistic rebel boyfriend, Jack. She hovers on the fringe of her school's social circle with her best friend Catherine. After catching onto Sam's extracurricular drawing habit, her parents enroll her into an after-school art course. While skipping her art course (after being unable to handle constructive criticism), Sam manages to save the President's life by jumping on the back of a would-be assassin. More worried about being found out about skipping, Sam doesn't really realize the magnitude of what she has done until the barrage of reporters begins. Sam winds up falling in love with the President's son, David, who is coincidentally enrolled in her art class. Her old feelings for Jack keep getting in her way, until she learns to see how they are holding her back. All-American Girl is a nice light read for any girl in the mood for a romantic comedy. It's fun and fast-paced with good comedic timing. I absolutely LOVED this book! This is one of Meg Cabot's best books! It did sometimes go on to more mature topics but overall it was wonderful! I love reading Meg Cabot books because they are so much fun and easy to read. This is a quirky love story complete with a multitude of top 10 lists. I just loved it! Samantha Madison is different. She is an artist. Her best friend is far from popular as well. She loves her older sisters boyfriend and her sister is smarter than she is. Her sister tells her parents that she is charging people to have their picture drawn with cartoons and movie stars so her parents force her to go to a art school. Samatha doesn't like the classes and therefor skips which puts her in the right place at the right time to save the presidents life. Saving hom brings on the press and whatnot there is even love in this book! When Sam is sent to take art lessons, she thinks she's ruined. While she's ditching the lessons, she notices something strange about the man next to her. Next thing she knows, she's tackling the trench coat man, and saves the President. From there, Susan, the art teacher, blackmails Sam into coming to the lessons, which she grows to love just as much as her growing feelings for David, the Presidents son. Another enjoyable novel by Cabot, that all teens will enjoy. Meg Cabots novel All American Girl is about Samantha Madison a girl who's into art, black, and indie rock bands. When she saves the presidents life by jumping on the assassins back. Suddenly shes named the teen ambassador of the UN, followed around like a celebrity, and invited to dinners to the White House. The only thing she wants is for her sisters boyfriend Jack to notice her. The bad mood, black wearing, deep thinking prince of her dreams. She meets the presidents son and decides to go out with him to make Jack jealous. Along the way she learns about herself and the boy she really wants to be with. This is a good teeny chic book. One of those books you will love if you like books with 9th grade romances and quirky main characters. This book is about Sam who saves the president's life. She turns into a national hero and is thrown into the media light. Then if thats not bad enough, the presidents son falls in love with her. This book is really good! Its really funny and thought provoking. This could really happen in real life but is not probal. Its really good and I recomend it to anyone who wants a light read and a funny read. this book is great!this normal girl frist saves the presidents life then becomes teen ambasador.then she out smarts the president and she ends up in a relationship with the presidents son.this book is really really funny and a good read,with great characters.the book continues in all american girl ready or not,not quite as good but still is a great read! Samantha Madison is fifteen years old and lives in Washington D.C. with her family. After getting caught selling celebrity portraits at her school, her parents force her to begin to take art classes twice a week. At the first class Sam is humiliated and vows to never return back to the class. Instead she decides to begin to ditch class and go to a nearby music store, . Everything goes fine with her plan until she stops a assassination attempt on the president. Now she is considered a national hero and is even invited to dinner at the White House with the president and his family! Sam is also named teen ambassador of the UN. But, Sam soon has bigger problems that spending her Wednesday afternoons at the White House with the press Secretary doing nothing, she is in love with her older sister's boyfriend Jack and might also have feelings for the president's son David. Before she knows it Sam has herself into a bit of a mess and has to find a way to fix it! But, is it to late? This book is wonderfully written and is just as hilarious as Meg Cabot's other books! Samantha is your average, all American Girl. She is stuck in the middle, with her older sister being popular and her younger sister being smart. One day she saves the day by saving the president from an assassination, and suddenly she is the most popular girl at school. It's written by Meg Cabot, who is an excellent author. I read this book not too long ago, and I thought it was really good. The story line was good, and Sam is a likable character.